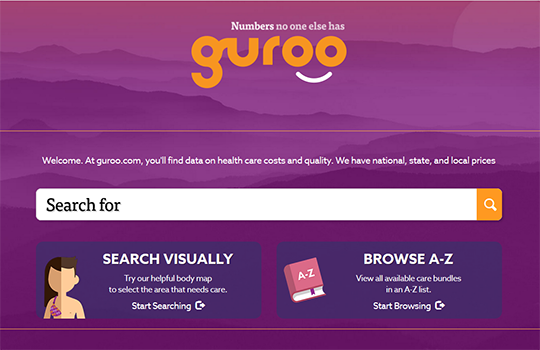 guroo.com provides national, state and local cost information for common health conditions and services using claims from multiple insurers for more than 40 million insured individuals. Guroo includes MSA, state, and national quality measures that indicate whether a population with a specific diagnosis or condition receives a recommended treatment that has been associated with better health outcomes. In addition to these types of measures, quality in health care also includes measures of health and health outcomes and experiences and satisfaction with health care services. Guroo has price estimates for 295 frequently searched care bundles. The site does not include physician-specific or hospital-specific date.